My friend and colleague Sadiqa Banu invited us home for Eid this past year. That is one day that will go down in our personal history books as the day Sudhakar and I ate as if we belonged to the third world country. I lost track of the number of helpings of biryani we took and the number of days after that, that we spoke of aunty's biryani. And so I asked aunty to come home and teach me how to make this dish that has remained elusive in my repertoire. Yesterday was the day. 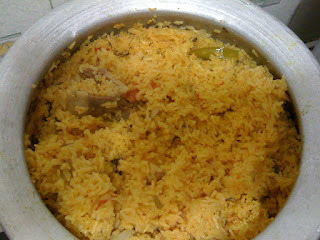 We decided to make the biryani with a kg of mutton and kg of rice. We used our ordinary white rice, which of course you can substitute with basmati at any time. Here is the recipe in pictures and in words to a pot-full of heavenly grub. Here is all that you need. 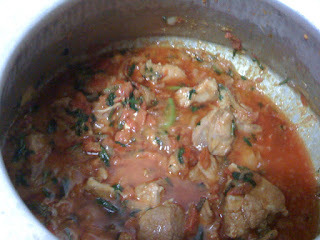 One kg of mutton, 1 kg of rice (I used raw rice), 5 medium sized tomatoes chopped, 5 medium sized onions sliced, a small bunch of mint leaves and coriander leaves torn to shreds, 3 heaped tbsps of ginger garlic paste, 2 tbsps each of garam masala powder and red chilli powder, 1 tbsp of turmeric or haldi powder, 1 heaped tbsp of curd, 2 green chillies chopped. For the rice - a 1/2 inch piece of cinnamon, 2 elaichis, 4 cloves. A dash of colour and a cup of grated carrot are optional. Boil water putting in the dry spices. When it is boiling, add in the rice and the colour. Cook till half done, drain and keep aside. Once you have all of this ready. Take a really huge vessel, preferably a hindalim based on. Put in about 200 ml of oil. Yes! I know that is a lot of oil but hey we are making a lot of biryani. When nice and hot, put in the sliced onions and fry them till the are almost cooked. Add in the tomatoes, mint and coriander leaves and a little bit of water. Cook till oil starts leaving the sides. Add in the ginger garlic paste and all the spice powders. Mix well and cook for a while. Add in the meat and coat the meat well with the mixture. Put in your tbsp of curd and the two chopped green chillies and salt. Add in sufficient water to make a gravy. Cover the vessel. The meat will take around 1/2 hour to 45 minutes to cook. When the meat is almost done, it will look like this. This is when you put in your half cooked rice and mix it all up really well. Put the lid back on the vessel. Place a tava on the fire and put your closed vessel on this tava. Fill another vessel with water and place this weight on the biryani vessel like so. The vessels will have to be kept this way for at least 20 minutes for the steam to build up. This is the 'dum' portion of making the biryani. You could open the vessel slightly after 15 minutes to check on the level of steam. Once the steam is good, switch of the gas and let the biryani stand still for around 15 minutes. You could try opening it with a flourish. I guarentee you... your house will be enveloped in the smell that emerges.